Sweet, rich, orange and light clover characters. Also known as Red Bush, it is known to have excellent anti-oxidant properties and is naturally caffeine free. This tea is from South Africa. At Adams+Russell, we like to make sure we are delivering the best we possibly can. That’s why we source and taste only the best quality teas, and the Redbush Rooibos is no exception. 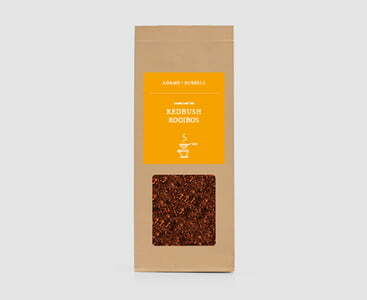 Rooibos actually translates to Red Bush, and is part of the Fabaceae family of plants in South Africa. The leaves of the plant are the main ingredient in this tea. Fresh Rooibos drinks have high content of vitamin C, which is helpful to fighting off cold and flu. But, that’s not all the benefits you get from drinking red bush on a regular basis. We have talked about the short term benefits of camomile tea here, as well as the long term benefits of Assam tea here. In terms of the rooibos, however, it is much more in line with the benefits of camomile. This is because your mind and body can receive many more short term body essentials, because of the lack of caffeine that’s present in the drink. While the benefits speak for themselves when drinking this beverage on a regular basis, there are some cautionary measures you need to take when considering your purchase. For example, this drink can’t be consumed when taking certain medication, as there can be serious side effects. This is specifically prevalent in chemotherapy courses for cancer patients. You may have heard the recommendation to always use fresh water when making your drink. The reason for this is that by re-boiling the water, it removes important oxygen particles which in turn gives your drink a metallic taste instead of a fresh flavoursome drink you would be expecting. Use one rounded/heaped teaspoon for at least 227g or 8oz of water. If you’re brewing for a few people, you will want to use approximately a rounded teaspoon for each cup you plan to make. Your teapot should have the size on it so you can work out exactly how much tea leaves you need to use. Brew for approximately 2-5 minutes, depending on how strong you want your tea to be. Add Lemon – Lemon is slightly different and will add some sourness to your drink. If your taste buds like this sort of thing it could be perfect for you. Add milk – It may seem strange to be adding milk but some people really do like it. So go ahead and give it a try. Used to buy this tea supplied by The Red Bush Tea Company, in supermarkets. Then the Company stopped selling via supermarkets. I tried suppliers but nothing compared until I found Adams Russell offering. An excellent tea, caffiene free, lovely flavour.